I’ve been invited by a group of woodworker’s in northwest Arkansas to teach a week-long workshop in traditional hand-tool woodworking this summer, and the starting point for the week’s exercises is the most important tool: the workbench. Each participant will build themselves a 6-foot workbench that will not only be the work platform for the week but will serve them as a heritage tool for generations to come. 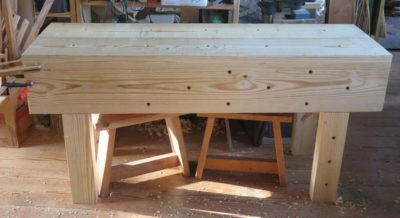 The sensible choice for the form of the workbench is the English Nicholson bench, given not only the time demands but the fact that I think so very highly of the form, its ease of construction, and superb performance. I have made no secret of my preference for the Nicholson if I was a beginning woodworker and could make and have only one bench for the rest of my days. It’s a moot point for me personally as I have lots of space and the means to build whatever (and how many) workbenches I want, but for either a beginner or someone with time and resource constraints, I think this is the path to follow. If I recall correctly Mike Siemsen shows building a Nicholson with a panel saw, brace and two five-gallon buckets, but I had my circular saw and power drill as the primary tools and used my butterfly sawhorse as the construction platform. I was able to build the basic bench before lunch time, and another half day tuning it up to full functionality. You can follow along as I unfold the project step-by-step in the coming posts. I built a short version of the naked woodworker bench (52in) for my winter shop (bedroom). It works great. Sometimes I wish it was longer, but you go with the space you have. It was easy to add a leg vise. I especially like the center stick and find that it works well with the planing stop when preparing rough boards. The thing with a good workbench design is that it can be scaled up or down easily. I’ve build “Naked Woodworker” benches 5-foot, 6-foot, 8-foot, and soon, 12-foot. Ditto Roubo benches, well not the 12-foot version but I was at FORP when a 16-foot version was built. “The space you have” is what determined the size of my little trestle/torsion box bench I made 30+ years ago, it was all I could realistically fit into the spare space in the basement. But the design was sound and the construction good, so it has served me faithfully all the years since.